The nearest railway station Vapi is about 14 km away where road transport is easily available. road: from Mumbai - Ahmedabad N.H. No. 8, Silvassa, the capital town of Dadra & Nagar Haveli, is about 180 km from Mumbai, about 120 km from Surat and about 10 km from Bhilad & 14 km from Vapi. Vanvihar Tourist Complex, Chauda at Khanvel and water sports and Tentage Complex at Dudhni are popular picnic spots of the territory besides the Island Gardens. There is a lion safari on road of Dudhni. And there is also Luheri Traking Senter & big garden and Tourist Complex also. Government Rest Houses at Silvassa, Forest Rest House and Vanvihar Tourist Complex at Khanvel and government Rest Houses at Madhuban Dam offer comfortable accommodation. Besides, beautiful cottages with all modern comforts are also available. Tribal Cultural Museum For those in hurry who can't spare time to meet the tribal in person, the tribal museum has it all displayed for them. The masks, hunting tools, fishing gadgets, musical instruments and the life size statues too. It will give you a feel of the territory and all that make the culture and people. Mini Zoo and Bal Udyan The zoo has colorful birds, mischievous monkeys, awesome pythons and sleepy crocodiles. For children's delight there are swings, slides and merry-go-rounds.Vandhara Udyan A riverside park with beautifully laid lawns dotted with exquisite pavilions, perfect for picnic - buffs. Quaint pavilions provide shelter to visitors. Pipariya Udyan This Park is full of roaring waterfalls, misty cascades, rustic stone walls, twin arches, tiny kiosks and vast emerald lawns, is really a delight to behold. The sprawling islands of flowers are a feast to the eyes. Wild Life of Silvassa There is good number of Panthers in the thick forest area of territory. There is Deer Park and very soon a Lion Safari park will be open for public. With the commissioning of Madhuban Dam on the downstream side of river Damanganga, a large water front has formed near Dudhani (40 Kms from Silvassa and 20 kms from Khanvel). For adventure loving tourists, the department provides water scooters, acquabikes, bumper boats, speed boats, kayaks, canoes and passenger boats at the Water Sports Centre, Dudhani. Abode to numerous gardens, this city also offers the titillation of Lion safaris and deer parks. The city abounds with Portuguese heritage and also has a Roman Catholic Church depicting the architectural designs of the same period. 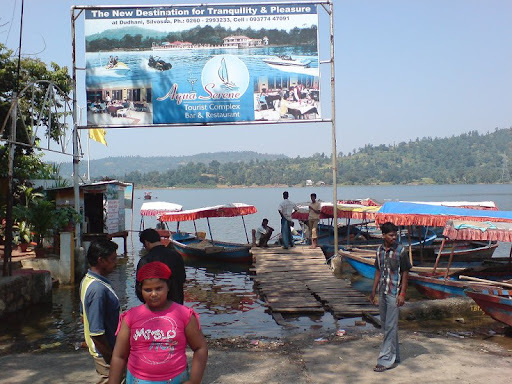 Another tourist attraction is the Madhuban Dam which provides the facility for boating and is an ideal picnic spot. Check out all best hotels in Silvassa.